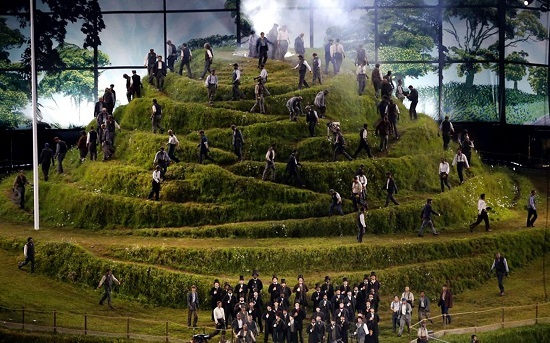 Olympic opening ceremonies provide modern states with a unique opportunity to spend vast sums of taxpayer money spreading cultural propaganda via the medium of mass theater. The ceremony is not only transmitted to millions of their own citizens but to hundreds of millions of foreign citizens worldwide. Outside the Olympics, the only state that regularly puts on such mass theater is North Korea. As in North Korea, the ceremonies allow the political elite of the state to reinforce its values over its population. 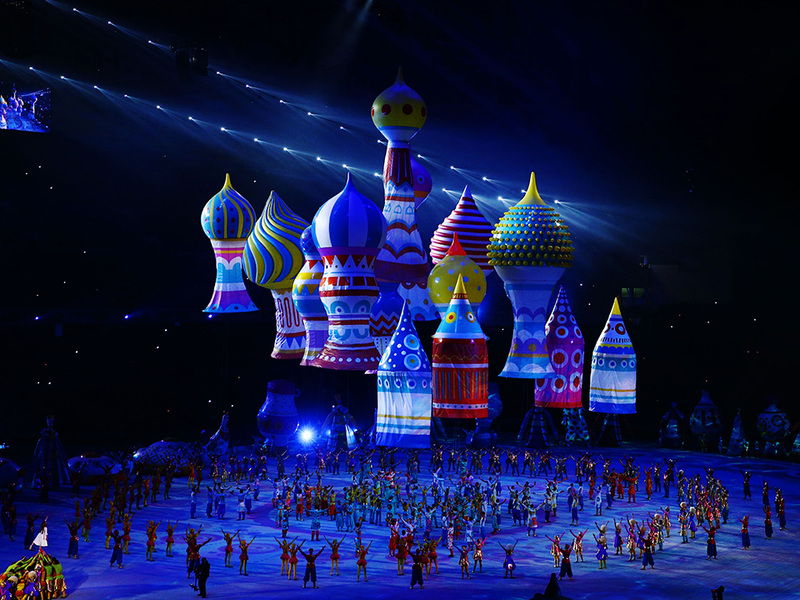 The drastically different opening ceremonies of London 2012 and Sochi 2014 provide us with an insight into the growing political chasm between Russia and the West. 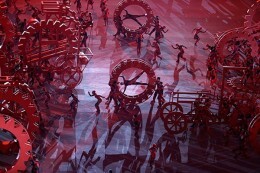 In the countdown to the opening ceremonies in London, the BBC talked about the political context of the games. 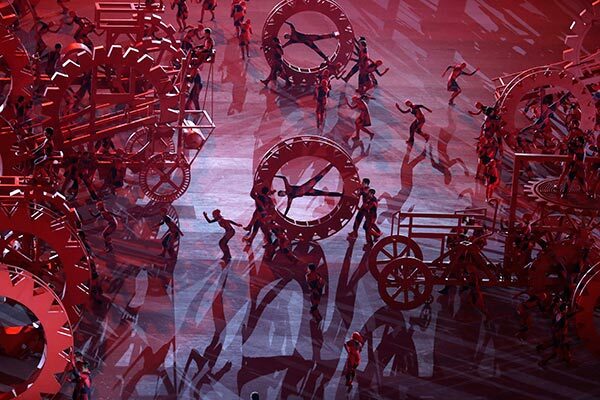 London, it says, was given the games because it is the most diverse city in the world. Sochi, however, the BBC tells us, is a controversial choice, given Russia’s terrible human rights record evidenced by a recent law that prohibits the promotion of homosexuality to school children. It is remarkable how quickly the Left has moved the goal posts in the culture war, given that as late as 12 years ago British teachers were forbidden to promote homosexuality to London school children. Now “gay marriage” is demanded as a civil right, and laws forbidding the dissemination of homosexual propaganda to children are now considered to be symbolic of classic Russian despotism. Despite this atmosphere the BBC’s gay presenter Clair Balding somehow managed to cover the entire ceremony without being kicked to death by roving anti-gay mobs or dragged away by the Russian police. 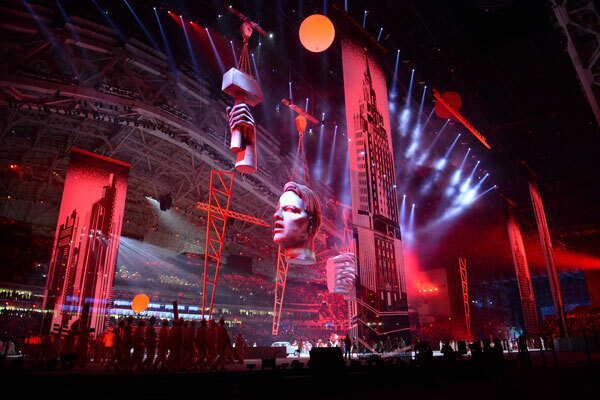 The opening ceremony for Sochi begins with a pre-filmed piece where a white child explores Russia’s achievements in science, art, literature, and music through the Cyrillic alphabet. 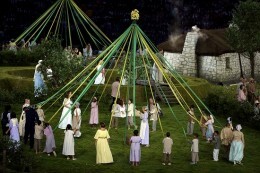 The camera then focuses upon the child in the stadium and follows her as she experiences the history of Russia throughout the ages, from its archaic beginnings traced back to Ancient Greece, through the middle ages and its emergence as a great European power under Peter the Great in the 18th century. The glamour of the aristocracy gives way to Russia’s enslavement under the central plan of the communists, shown symbolically as a great train moving across the stadium. The performers represent tiny human cogs in a great industrial machine that grinds ever forward. The second world war is given only the briefest of mentions before the ceremony takes a nostalgic look at life under post-Stalin communism. It shows that, however, corrupt and cynical the politics of the period had become, ordinary Russians found meaning in their private lives. They are shown falling in love, marrying, and raising families surrounded by a barrage of party slogans that one conformed to in public but did not believe in private. This piece is a celebration of the traditional family, which in a great historical irony was preserved far more under Soviet totalitarianism than it was in the West. Promotion of the traditional family and increasing the Russian birth rate are key planks of Putin’s political agenda, and they are represented symbolically in this piece. In contrast, the opening ceremony for London begins at the source of the Thames, the river that runs through London. The camera flies over the river route to London, occasionally switching to slow motion to show the human activity around the river. Thirty seconds in, the viewer is treated to a slow motion shot of a grinning black child prominently featured in the very English countryside: the first of many blacks. The history of the British people goes back 5,000 years; however, the director Danny Boyle omits any mention of Britain’s rich and glorious past. What we are presented with is a peculiar Leftist myth where society begins in perfect equality only falling into inequality by rapacious capitalism. However, through political struggle and more than a dash of non-white enrichment, Britain is transformed into the vibrant and politically correct New Jerusalem it is today. The theatrics begin in an idyllic 17th century English Village with the country folk enjoying a very English game of cricket. As the camera pans around the village, we notice that the bowler is black, and indeed so are many of the villagers who are casually interacting in perfect equality with their fellow white Britons. The message one is expected to take away is plain. Britons are a mongrel race. Britain has always been a nation of immigrants. This harmonious equality is then rudely interrupted by capitalism and the industrial revolution in which the classless society is replaced by an unequal relationship between capitalists and workers. The rural scene is visibly transformed into dark satanic mills where a dozen top-hatted gentlemen direct the toiling multi-racial working class in the construction of great factories. Whenever the camera focuses on the top-hatted capitalists it takes great pains to track the single black man amongst them to show that not only were blacks represented amongst the titans of industry, but they led the industrial revolution. 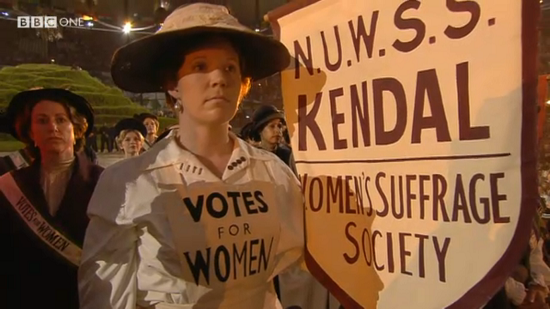 The industrial revolution then yields to the progressive era as dozens of marching suffragettes appear holding banners demanding votes for women and fighting against the oppression of their traditional gender role as mothers and nurturers. Feminism is born. 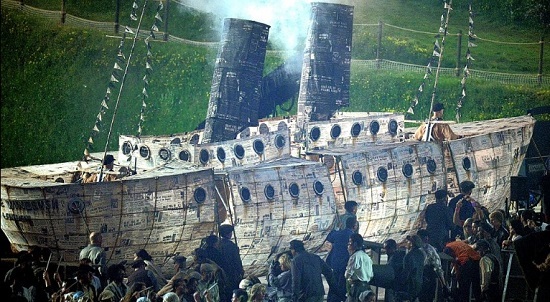 After two minutes of silence in remembrance of the dead of the two world wars, the viewer is presented with the fruits of their sacrifice, namely a scale model of the Windrush, the cruise ship which transported the first black immigrants to Britain beginning a process of mass non-white immigration which has now reduced native white Britons into minorities in their own capital city. The viewer is reminded that these migrants keep Britain’s National Health Service running by showing black nurses affectionately tending to the needs of sickly white children. The message is that mass immigration has been an unmixed blessing for the British people. The progressive history lesson complete the audience is brought to the present day through the eyes of the “typical” British family: a black man and white woman with two mulatto children (although the skin tone of the teenage daughter, whom the camera follows, is far lighter than the common product of miscegenation). In a performance highlighting the transformation of technology on pop culture, the teenage daughter concludes the piece sharing a passionate embrace with a black youth that she has only just met. Unlike Sochi, which embraced high culture and tradition, in London such things exist only as a target to be mocked and brought low. This can be seen firstly in the buffoonish behavior of Mr. Bean inserted into the London Symphony Orchestra in order to lampoon the classic musical score from Chariots of Fire, an iconic British film of the 1924 Olympics. Secondly, in the commencement speech Queen Elizabeth voluntarily debases herself and the institution of monarchy by parachuting out of a helicopter in a James Bond skit in order to court the capricious favor of ironic hipsters. Given that her reign has been marked by indifference and betrayal of the British people, it is unsurprising that the queen agreed to do this. Aside from a handful of North Asian countries like Japan and South Korea, the winter Olympics is a white sport as demonstrated in the athletes’ procession. In London almost every white country had a multi-racial team. In Sochi, every European and North American team was almost without exception completely white. With the sole exception of the Jamaican bobsled team, the black Caribbean nations were all represented by white athletes who were using the island nations as flags of convenience in order to compete at the games, a complete reversal of London, where many European nations imported non-white athletes from foreign countries in order to build a more competitive and diverse team. At each Olympics the flag raising ceremony is an opportunity to honor important national heroes. In Sochi the flag bearers were all white Russian and comprised former Olympic champions, a cosmonaut, a director, an actress, a musician, and a Russian journalist who documented the war in Syria. In contrast, most of the London flag bearers are non-white, many not even British citizens. There was Ban Ki-Moon the UN Secretary-General from South Korea; Hailie Gebselassie, Olympic marathon champion from Ethiopa; Leymah Gbowee, a black feminist and NGO bureaucrat from Liberia; Shami Chakrabati, the Asian director of Liberty, an organisation dedicated to protecting the civil liberties and human rights of everyone except people like Emma West, Nick Griffin, and Simon Sheppard. Other notables included Marina Silva, a Brazilian environmentalist with an African father and Portuguese mother and Doreen Lawrence, a Jamaican immigrant and mother of the martyred saint Stephen Lawrence, a black man who was allegedly murdered by a gang of white men. Doreen Lawrence has made a lucrative career out of her dead son and has campaigned to end the double jeopardy rule, which prevents the same person being tried twice for the same crime. Having destroyed an ancient safeguard to prevent the tyrannical abuse of state power, the Stephen Lawrence trial was re-run in order to deliver the politically correct verdict. With no hint of irony she is a prominent board member of Liberty and works with Shami Chakrabati to campaign for, amongst other things, fair trials. Sally Becker, a humanitarian aid worker in the Bosnian war was the only token white Briton amongst them. Her qualification for holding the flag was that she had dedicated her life to helping strangers in foreign lands. One might be fooled into thinking that the organizers actually allowed a white British man to hold the flag, but further investigation shows that the white man was in fact an Israeli Jew born in Argentina named Daniel Barenboim. The ailing former boxer and Black Nationalist Mohammed Ali was then invited to bless the flag. The two ceremonies were polar opposites of each other. 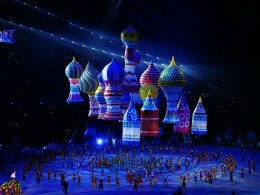 On the one hand, the ceremony in Sochi was a celebration of the Russian people, high culture, and tradition. It was in style and content implicitly white without any attempt to alienate a global audience of many races. The London ceremony was notable by its complete erasure of the British and its replacement with an explicitly anti-white, egalitarian political agenda. As in North Korea, everyone in Britain was expected to smile and cheer for this ceremony, and in subsequent days the political correctors in the media and the workplace jumped on anyone who expressed the mildest reservations.